Because the United States has elected Donald Trump—a toxic Hot Pocket glued to a micropenis—to serve as our nation’s president, it’s crucial to parse the conflicts of interest that might influence his judgment while in office. Unsurprisingly, the boundary between his political and business endeavors is a feeble one. The Guardian reports that American political history has never before seen a president-elect with so many conflicts of interest. The concern, of course, is that his financial pursuits, of which there are many, will shape the legislation he seeks to pass. Over the past months, many Americans have protested the construction of the Dakota Access pipeline, which would ravage land sacred to American Indian communities. In his first 100 days in office, Trump has promised to smooth the way for pipeline construction. With holdings in Energy Transfer Partners—the company building the pipeline—the president-elect will benefit from this project’s success. Trump, then, should theoretically put his business dealings in the hands of someone who will not under any circumstances disclose developments or decisions made. Of course, impartiality is difficult in any case: you cannot simply forget where you have invested or how you managed your business pursuits before taking public office. It’s thus especially concerning that Trump’s children, Donald Trump Jr., Eric, and Ivanka, will manage the trust with their father’s holdings. And yet, when Trump’s presidential transition team was announced, Trump Jr., Eric, and Ivanka were named as members of the executive committee. Karl Sandstrom, the former chairman of the Federal Election Committee (FEC)—the entity responsible for campaign finance—tells the Guardian that Trump is not stepping away from his business interests the way a president-elect should. In short, he is not establishing a blind trust. “A blind trust is not anywhere near the same,” he explains. “You don’t still have access to the decision being made.” What’s more, Trump’s assets will remain in his name, as well as undivided — at the very least a symbolic indication of his continued involvement. 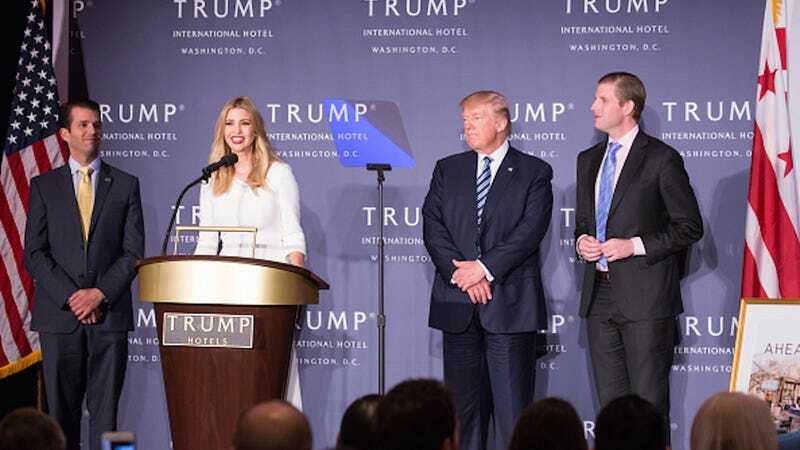 Then there is the matter of Trump’s property: hotels in Chicago, New York City, Las Vegas, Waikiki, and now in Washington, D.C. Abroad, his properties extend across the globe: Istanbul, Mumbai, Vancouver, Seoul, not to mention other international sites. His business partner in a real estate project in Azerbaijan, Anar Mammadov, was accused via Wikileaks of money laundering. And, despite what Trump has claimed regarding ties to Russia, he has purportedly met with potential Russian investors to discuss a variety of deals abroad. But hey, chins up! Considering Donald Trump’s maturity and robust code of ethics, I’m certain we have nothing to fear.